Includes Lamp and (2) 1/4 turn lock mounting Omega Brackets and Powercon to L620. Clamps not included. Created specifically for follow-spot operation, this custom modified version of BMFL comes with specific features to provide both motorised movement and manual operation with follow-spot handles. Based on the powerful BMFL WashBeam it blasts beams of extra bright output and has an abundance of great features. The BMFL FollowSpot takes advantage of its wide 160 mm front lens and a high CRI 1700W lamp. 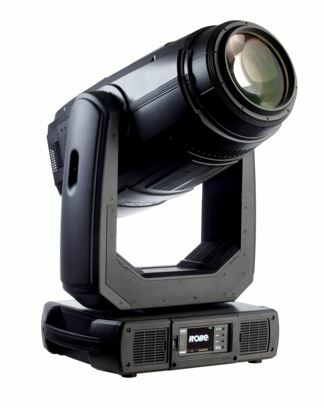 With a custom light source designed for Robe it produces an astounding 250.000 lux at 5 metres and has a wide zoom range of 5° to 55° with precise focusing. Manually or remotely controllable features include smooth color mixing and CTO flags, two color wheels, multiple variable frost filters, focus, zoom and quick pulsing iris. Follow-spot operation can be extended by using LightMaster handles - an optional accessory. The BMFL FollowSpot is pre-wired for installation of the digital camera on the head and is connected with the new RoboSpot base station for off-stage follow-spot operation.